Charter Boat Captain Teddy Naftal has been living on the edge of the Picayune Strand State Forest in Naples for a couple years. His property is surrounded by sprawling ranch land and a lot of animals. Naftal said he’s used to seeing wildlife. In fact, it’s part of the reason he moved here. Naftal is a hunter. He said he also wanted to move to a property where he could keep a couple animals, mostly for tax purposes, but animals are part of the problem now. Naftal’s talking about panthers. More specifically, the endangered Florida Panther. A couple decades ago, it was on the brink of extinction. In the 90s, there were less than 30 panthers roaming the state. That’s why biologists bred them with Texas Cougars, which are genetically identical to Florida panthers. The breeding worked. Right now, there are about 160 in the wild. However, a lot has changed here in Southwest Florida since the 90s. This area may be a stronghold for the panther, but right outside their refuge, there is heavy development. Ken Warren, a spokesman for U.S Fish and Wildlife, said humans spent years encroaching on panther land and now the booming panther population is creating the opposite problem. Panthers are also particularly drawn to areas like Naftal’s property. Panthers can roam relatively safely there and there’s cattle for them to feed on. Naftal said right now he has three calves and a bull. But, he’s losing new cows all the time. Naftal said his daughter brought in several miniature goats a while back. But, he says they didn’t make it a week before getting picked off by panthers. Naftal said he has a few donkeys, too. He bought them to protect the calves. And they’ve been trying – mostly unsuccessfully— to keep the panthers at bay. Even though Pedro is a little worse for wear and Naftal’s herd is getting smaller, he said larger cattle ranchers in the area have it much harder. In fact, around four years ago commercial and small-scale cattle ranchers started noticing a lot of their calves – and other livestock-- were missing. Ranchers suspected panthers. So, U.S. Fish and Wildlife paid for Caitlin Jacobs, a graduate student at the University of Florida, to conduct a study. Over two years, Jacobs ear-tagged and monitored 200 cows at two different ranches in the area. She said in that time one rancher lost about 5 percent of her calves to panthers. The other lost about point-5 percent. Now, state and federal officials have to figure out a way to make sure panthers don’t end up seriously hurting ranchers in Southwest Florida. 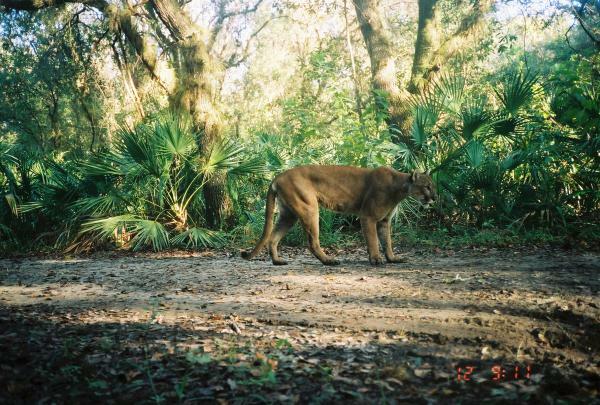 Besides the fact that cattle is big business in Florida, Warren points out ranchlands have also helped panthers rebound. Florida Fish and Wildlife Commissioner Leisa Priddy owns a cattle ranch in the area. Her ranch was part of Jacobs’ study. She was the rancher that lost 5 percent of her calves. Priddy said dealing with panthers is a tricky situation mostly because of strict federal laws protecting panthers. “There’s nothing whatsoever that we can do to dissuade the panthers from preying on our calves at this point,” she said. State and federal officials are trying to figure out a way to offset the cost of living around panthers. State panther biologist Darrell Land said there’s a pilot program in the works that will pay ranchers for maintaining land in panther areas. Land said this would be better than paying ranchers for each animal killed by a panther because most of the time it’s hard to prove. Ultimately, though, both Land and Commissioner Priddy explain any program should be funded by the federal government since all Florida Panther regulations are federal. Land said that could be another hurdle. “We are very hopeful that that pilot program will become a more permanent type of program, but unfortunately that may mean that Congress will have to fund the program and right now they don’t play well together,” Land said. Warren said the goal is to have three viable populations with 240 panthers each before the recovery can be called a success, though they are re-evaluating that criteria. He also says they need to find a way to get the panther population to naturally migrate north, which could help Southwest Florida. While state and federal officials try to work out a plan, Naftal wants more regulations on the panthers. Specifically, he wants his animals protected from these predators. Until then, though, Naftal said he’s thinking of moving. 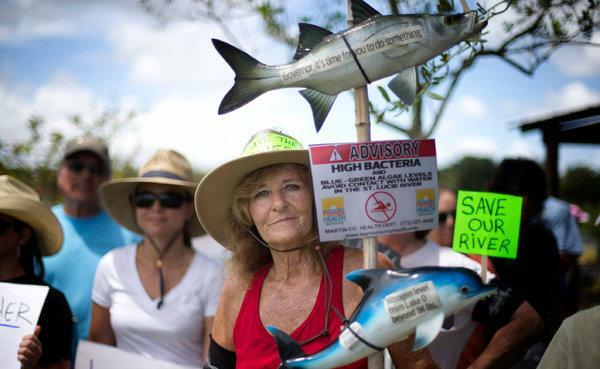 After massive rainfall this summer sent heavily polluted Lake Okeechobee to historic levels, the U.S. Army Corps of Engineers had to decide whether to risk that the 143-mile dike would hold -- knowing several small communities in the water’s path would be wiped out if it broke -- or devastate several estuaries and their wildlife.